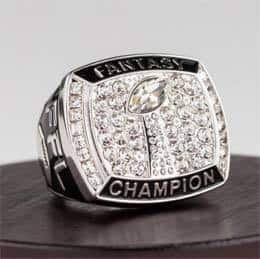 Today I'm going to reveal to you the best fantasy football rings for the 2019 NFL season. If you've struggled to find fantasy football rings that are just right for your league, or you're considering buying a championship ring but not quite sure where to start, you're in the right place! Fantasy championship rings are excellent prizes for fantasy football leagues because they're inexpensive, long-lasting, and something league champions can keep forever. Whether you're looking for a fantasy football championship ring that blings, a more conservative design, or a cheap championship ring for a budget-conscious league, I've got you covered! My top 4 fantasy football rings are summarized here, and I review each ring in detail below. You can click on any of these product links to quickly check their current price. Why buy a fantasy football championship ring at all? 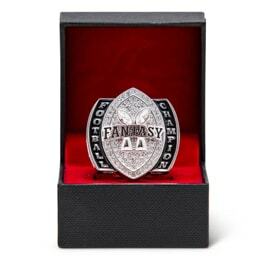 A fantasy football ring is one of the best fantasy football award ideas because they're like a wearable championship trophy that goes everywhere you go. Sure, some might be big & gaudy, but that never stopped NFL players from flashing their Super Bowl bling! At one-time fantasy football championship rings used to be cost-prohibitive. However, as these champion rings have grown in popularity, prices have come down considerably. Now there are several companies offering quality rings that even budget-conscious leagues can comfortably afford. But not all fantasy football rings are created equal. There are many cheap, inferior rings being sold all over the Internet. The last thing you want is to buy a fantasy football ring that will turn your league champion's finger green (even though that would be really funny)! If you're looking for ways to lighten-up your fantasy football league, consider buying a fantasy football loser trophy that can be shared among your last place teams from year to year. When searching for the best fantasy football ring, there are a few critical factors to consider. Metal Composition - The metals used in a ring's construction dictate its weight and strength. Cheap metals are light, easily damaged, and can discolor your skin. Vendor Reputation - Limit your choices to football ring vendors with the best user reviews and responsive replies to user concerns. Every merchant in this review is an established company with proven customer service. Affordability - Don't overpay for a ring. The fantasy football rings in this review are comparable in price to your average fantasy trophy. Awesome fantasy football trophies usually cost right under $100, but a quality championship ring should cost substantially less than $100. Ring Size Availability - Picking a fantasy football ring with just the right fit is critical. 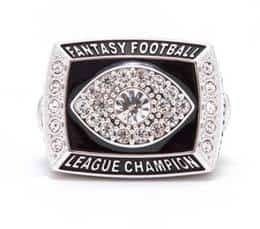 Before you buy a fantasy championship ring, be sure the ring you choose is available in your league champ's size. Championship rings are not a new concept. The NFL, NBA, NHL, and MLB all award rings to the players of their respective championship teams. These rings are coveted awards, and the number of rings an athlete owns is often used as a measuring stick to judge that player's career. The same theory applies to awarding a championship ring in fantasy sports leagues. It's a unique and righteous way to recognize the most dominant team in your league. For years, the only option for fantasy leagues when awarding prizes was to buy a trophy. Now, leagues can choose between trophies, fantasy rings, and even fantasy championship belts (check out my list of the best fantasy football belts). When evaluating any ring, pay particular attention to the metals used to manufacture the ring. 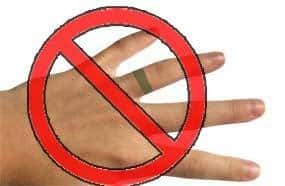 Cheap rings that are coated with metals such as copper can interact with chemicals in your skin to leave an ugly green ring on your finger. This may have been acceptable when you were ten years old and got your jewelry from a $.50 bubble-gum machine. But now that you've "matured", it's time to start enjoying some of the greater things in life. None of the football rings in this review contain copper. They are all comprised of heavy and durable metals including zinc and metal alloys, then usually plated with gold or silver. Rest assured that when purchasing one of these fantasy football rings, you'll be receiving a quality piece of jewelry that will last. Some leagues have a trophy that gets passed between champions from year to year. These perpetual trophies typically have large, engravable plates that provide room to etch the names of the championship teams. Naturally, fantasy football rings don't fit into this prize model because of their small size. There is only limited space to engrave anything beyond maybe the year. But another reason why you can't pass a ring along from champion to champion is that your league champs almost certainly have different ring size requirements. As such, it makes more sense to award a championship ring each and every year. Luckily, fantasy football ring prices are very reasonable, making this type of award affordable for just about any fee-based league. Even with a nominal $5 entry fee each year, leagues can comfortably afford to award a championship ring every year. As a matter of fact, a 12 man league with a $5 entry fee could afford our top-ranked championship ring for 2019. Each fantasy ring manufacturer produces a different range of ring sizes. It's essential to know your target ring size before buying a ring because size availability could limit your options. Ring vendors typically carry the most common ring sizes but sometimes have limited stock for each size. As such, ring size is an essential consideration (maybe the most important factor) to ponder when buying a ring. If you don't know your ring size, it's very straightforward to figure it out using one of the methods described next. 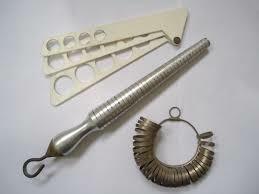 Any jeweler can size your ring finger very quickly using a variety of different instruments. If you have a ring that already fits you well, they can use a ring mandrel tool to determine its size. If they don't have that tool, they'll use metal ring sizers, which are ring-shaped templates that you try on until you find one that fits just right. Visiting a jeweler is what I suggest if you want to get the most accurate fitting possible. They eliminate the guesswork and will ensure you order a ring that fits comfortably. Even if you purchase a ring and it doesn't quite fit right, most of the vendors reviewed in this article will be happy to exchange your ring for one with a better fit. Just check out the customer reviews for each fantasy football ring. You'll see instances where customers have done just that, with no hassle. If you're pressed for time or don't live near a jeweler, you can still get a rough estimate of your ring size MacGyver style. Believe it or not, you can determine your ring size using everyday items found around your house. For instance, wrap a strip of paper or a piece of string around your ring finger and make a mark where they start to overlap. 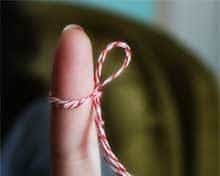 Then, measure the paper or string with a ruler to get a length representing the circumference of your finger. Finally, use this sizing chart to determine your ring size based on the measured length. The video below illustrates how easy it is to estimate your ring size. Our top 4 fantasy football rings include the most stylish (yet affordable) rings on the market. But people have different tastes and, no one ring is perfect for everyone. Each fantasy football ring reviewed below has its strengths and weaknesses. I will highlight these pros and cons after each ring review. This third-generation ring from Fantasy Jocks is the Rolls Royce of fantasy football championship rings. It's one of the pricier rings in this review, but if you're looking to turn some heads then look no further than this beauty. This large and heavy fantasy football ring is embellished with sparkling rhinestones. The stones surround a beautiful, sculpted likeness of the Lombardi Trophy- itself constructed of even more brilliant stones. The top and the bottom face of the ring spell-out simply: "Fantasy Champion." Enough said. Again, this fantasy championship ring is on the higher end of the pricing range (not the most expensive). But for those of you that must have the most magnificent ring on the market, the v3 ring from Fantasy Jocks is the answer. The silver version of the ring pictured is super-nice, but you can also order a gold version of the same ring if that's your style. Screams "I am the Champion!" The v4 edition of the Fantasy Jocks Fantasy Football Championship ring is their latest and greatest design, released just in time for the 2019 fantasy football season. This contemporary design has been in the works for a while and combines some of the best qualities of their previous ring models. Whereas the previous championship ring versions leaned heavily toward either bling or modesty, the v4 ring instead takes a middle ground. It has an element of flashiness with the many rhinestones encrusting the face of the ring, but the sides of the v4 are simple and help to offset the glitz of the football-shaped center. I like the fact that this ring has some an element of depth. Instead of being a glorified class ring on steroids, it has a unique shape and architecture that sets it apart from just about every other fantasy ring on the market. If you're looking for a modern ring that straddles the line between snazzy and classy, check out the latest v4 fantasy championship ring from Fantasy Jocks. The Fantasy FFL Champion Ring from Decade Awards doesn't flash the same bling as the other fantasy football rings in this review. But that could be a plus for owners who prefer a classic look. This design is slick and clean but isn't wholly devoid of glitz. Eight small stones adorn the ring face, four on either side. For the reserved fantasy champion, this adds some flashiness without going overboard. This ring is made of die-cast zinc for high impact strength. As a nice bonus, each ring comes in a free display box. If you're looking for a cheap fantasy football ring because you're in a budget-conscious league, this may be the prize you're looking for. The customer reviews for this ring on Amazon are solid, and it is available in quite a few ring sizes. Fantasy Jocks has established itself as one of the top fantasy sports vendors on the market. It's no wonder they have three fantasy football champion rings in our top four choices for 2019. This monster weighs in at a solid 3 ounces. It is silver plated and packed with sparkling glass stones. No one will ever know these aren't flawless gemstones! This fantasy football ring has had its day in the sun, and still could be the best ring for leagues on a budget. But I predict the v3 Championship Ring by the Jocks will eventually become the most popular design. Never one to skimp, the Jocks will deliver your fantasy ring in a stylish ring box with red velvet interior. You'll feel like you're presenting this ring to royalty! This gem was Fantasy Jocks' first introduction to their line of fantasy football super bowl rings. While not as flashy as their newer rings, this fantasy football ring is a hugely popular product that set the stage for the impressive ring design iterations to follow. I admire this fantasy football champion ring because it has a great balance between the text, imagery, and stones. It will catch people's eye, but not necessarily blind them. This ring is made of brass but plated in Rhodium. Rhodium is commonly used to plate white gold FFL rings and gives them their ultra-white color. Any fantasy champion would wear this ring with pride. Fantasy football rings are no longer an obscure fad. With their affordable pricing and attention-grabbing ability, they're becoming a favorite championship prize in many fantasy football leagues. My pick for the best fantasy football ring of 2019 is the v3 ring from Fantasy Jocks. It's the most massive and magnificent trophy ring on the market. If you've committed to broadcasting your fantasy dominance to the world, you should go big or go home. If you like Fantasy Jocks' line of championship rings (I know I do), check out my review of Fantasy Jocks where I break-down their full range of fantasy sports prizes.